Using a slow cooker can make your kitchen life a breeze. Often, slow cooker recipes require only two easy steps: to dump the ingredients in and to turn on the appliance. If you have a busy day ahead, the slow cooker can be your best friend. You can set the machine before leaving the house and come home to a homemade meal. There is no such thing as being too busy to cook when you have a slow cooker. Forget spending all your money at your favorite restaurant because now you can recreated the most beloved recipes in the slow cooker. From Olive Garden to Chipotle, there are copycat recipes that you will eat up, literally. You don't even have to worry about making a reservation with your slow cooker; it is ready when you are! Take a break for dinner tonight with one of these slow cooker dinner ideas. No matter which one you choose, you'll love it! Soup recipes are some of the easiest recipes to make in the slow cooker. Soup are most flavorful when they are cooked low and slow, making the slow cooker the perfect soup cooking tool. Slow Cooker Olive Garden Copycat Minestrone Soup - This hearty soup recipe can easily be enjoyed as a meal. Copycat Benihana's Japanese Onion Soup - This simple soup recipe is perfect as a starter. Copycat Bob Evans Chicken and Noodles Soup - This classic soup recipe is insanely easy to make. Just-Like Outback Steakhouse Easy Potato Soup - This potato soup recipe is a perfect copycat recipe. Knockoff Bob Evans Cheddar Baked Potato Soup - There is nothing better than a cheesy soup just like from the restaurant! Slow Cooker Copycat Olive Garden Chicken and Gnocchi Soup - This Olive Garden soup recipe will wow your friends. Imitation Wendy's Chili - This is known as the best chili recipe out there. It doesn't hurt that it's also made in the slow cooker! Poor Man's Stew - Even if you are low on funds, you can still enjoy a great meal. Copycat Paula Deen's Easy Potato Soup Recipe - This is just like Paula Deen's classic soup recipe. Cooking meat in your slow cooker is easy and you don't have to worry about what temperture you are cooking your meat. 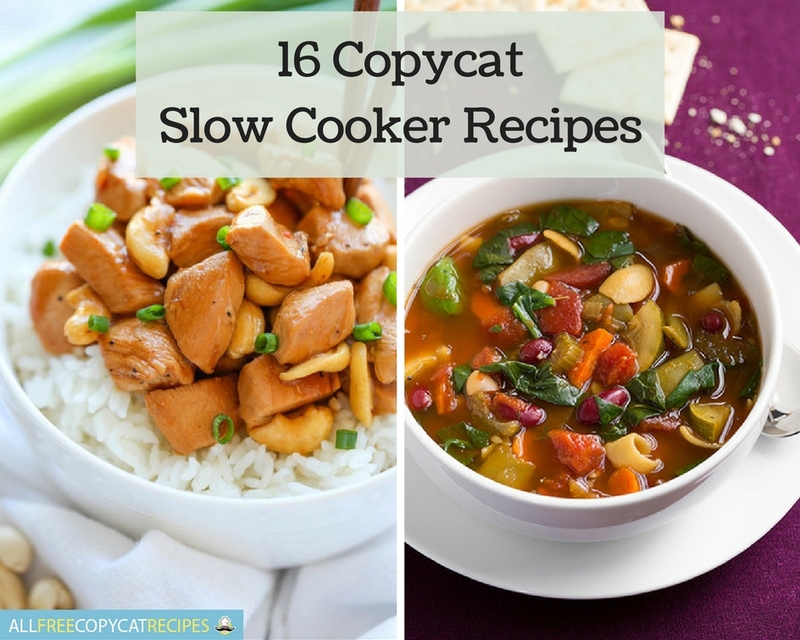 Pork recipes and chicken recipes work great with the slow cooker. Chipotle's Pork Carnitas Copycat - This Chipotle copycat pork recipe is pure heaven. Cafe Rio Pork Barbacoa Copycat - This classic barbacoa recipe is great for a party. Garcia's Pollo Fundido Copycat - This bold chicken recipe makes a great dinner. Slow Cooker Cafe Rio Copycat Shredded Chicken - This juicy chicken recipe will wow you and your guests. Homemade Slow Cooker Cashew Chicken - Homemade cashew chicken is such a great crowd pleaser! Slow Cooker Italian Beef Recipe - It's slow cooker beef with an italian twist! Slow Cooker Restaurant-Style Chicken Parmesan - This really tastes exactly like what you would order at a restaurant. Cut down on spending without cutting down on flavor with: 21 Budget-Friendly Recipes: Cheap Dinner Ideas for the Thrifty Chef!